If you are often down on yourself, ask God to give you the proper perspective on yourself and your life. Thank Him for creating you, saving and loving you, and giving you purpose. One of the best ways to stop the negative self-talk is to focus on others and help them in some way. Ask God to help you not hinder what He wants to do in your life with any negative self-talk, but instead help you to focus on helping others. A woman on a private facebook group I belong to shared this quote from Stormie Omaritan’s book 30 Days to Becoming a Woman of Prayer. Although this book is for a female audience, I was moved as a male to respond, because guys, I think to truly love our wives, we need to take the time to hear what they think about and what is important to them. It is a shared journey, not a separate one. Why should we expect our wives to care about our interests if watching a football game with our buddies is more important than sharing quality time with them? Yes, we need to have our guy time, just as ladies need their gal time. I am confident enough in my masculinity to say I love Stormie Omaritan’s writing, especially her prayers. This is why I took the time to respond to her quote. I would welcome reading your thoughts on what I am sharing with you. I have a rare life-threatening condition called mastocytosis. I have way too many mast cells, which are the cells that form part of your immune system and are in your tissues. According to a University of Toronto report “Mastocytosis Disease of a Thousand Faces” the condition is seen in 1 in 500,000 people in developed countries. My wife calls it allergy on steroids. I describe it as a neighbourhood block party out of control. I have been intubated eight times. I take several mast cell stabilizers to stay alive. I share this part of my journey with you to give further emphasis to the quote from Stormie Omaritan. I see each day of life my Lord gives me as a gift. I am here for His time as we all are, to leave the lives of those we have touched filled with a little more light, a little more hope, even just a little more beauty. With each breath I breathe I say prayers of thanks to God for another day to thank Him for loving me a sinner saved by His unconditional love, to look into my darling’s eyes and see her love shining through them, to see the sun streaming through the windows of our home, to see the antics of our kitties, Sir William of Lounge and Her Royal Highness Catherine of Englehart, to thank God for the home we live in when millions in the world are homeless, for family and friends who love me, for enough food to eat when millions are dying hunger’s cruel, sometimes long and painful death, for the sweet chirping of a bird and one more day to serve my Lord. Yes, I have my down days. I think if we were to be truly honest about it, so many of us have difficult days. When the bills keep coming for medications because my government won’t provide all the ones I need on Ontario Disability, there are times I find it difficult to be positive. When I look into my wife’s eyes and see her sadness, that slow death of hope, though she is a woman with a strong faith that inspires my own, the angst over the daily struggles to get through the month, the having to go hat in hand asking others for help because doors of opportunity to start a counselling practice while starting to open haven’t yet, struggling each day with how reliable my health will be, singing songs of joy and praise to my Lord are hard. Yet, if I stay there, if my focus is merely how awful our circumstances are, then God can’t use me to bring hope to others, to tell them that beyond their darkness of today there lies a far brighter tomorrow. Always remember that your life is a gift from God. Don’t take my word for it. It’s in the Bible. James 4:13 -17, J. B, Phillips New Testament. “Just a moment, now, you who say, “We are going to such-and-such a city today or tomorrow. We shall stay there a year doing business and make a profit”! How do you know what will happen even tomorrow? What, after all, is your life? It is like a puff of smoke visible for a little while and then dissolving into thin air. Your remarks should be prefaced with, “If it is the Lord’s will, we shall be alive and will do so-and-so.” As it is, you get a certain pride in yourself in planning your future with such confidence. That sort of pride is all wrong. No doubt you agree with the above in theory. Well, remember that if a man knows what is right and fails to do it, his failure is a real sin.” Other versions say your life is like a fog or in others it says your life is a vapour, that appears for a short time, and then it is gone. 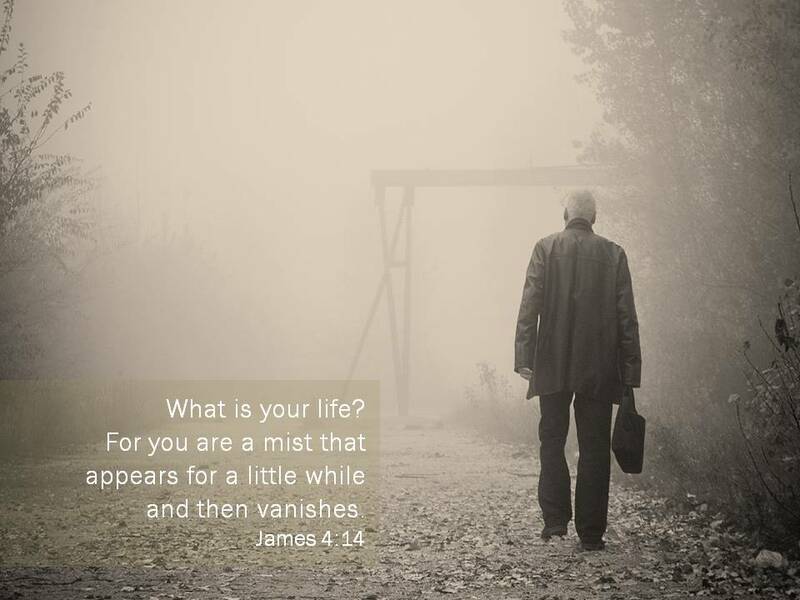 Why would James ask such a strange question that appears to be without hope, that says your life is only a temporary one, that you are but a mere sojourner here for a while and then you are gone? I think in the question there is another more hopeful question. How will you choose to live your life? None of us no matter how rich or healthy we are has an endless lease on life. We will all die. I know. Life can be rough. Each day my wife and I face the bitter reality that I could die that day. We all face that reality. You could step outside and be killed by a car hitting you. You could die in an accident. You could be murdered in a convenience store robbery. You could die from a heart attack, stroke or be taken from one heartbeat to the next with a brain aneurysm. All of us will die and I believe will face another far more important question from our Lord. What did you do with the life I gave you? No man, woman or child can escape from being faced with the reality that they will face that question of eternal importance God will ask me, you and all of us. Did you live your life not counting the cost and live for others and not yourself? Let us all make a choice today that we will live as if each day is our last day of life. If we ask God’s help life will take on a more positive perspective, as we focus more on our blessings and less on our circumstances. Who knows? We may find that life becomes more of a sweet gift as we think more about others than ourselves. Then, another question will form. Lord, how can I be the best blessing to others? If you ask your Lord this question with all the passion of your soul, He will show you so many wounded lives that are begging to be healed, so many broken lives crying out to be mended. That is when we truly become Love, God’s love poured out and running over.